Attractive, customizable, full of character—our landmarks help you make a statement that stands out and stands the test of time. Working with artists, architects and monument dealers, we use time-honoured techniques and advanced technology to create stunning masterpieces—everything from granite apples and signage to fountains and war memorials. Our landmarks are on display in major North American hubs, including Toronto, Hamilton, Buffalo and New York City. At HGH Granite we provide personalized service at every stage, taking projects seamlessly from start to finish. Our meticulous attention to detail ensures that every landmark is an accurate and long-lasting rendition of the original concept, no matter how challenging. From shipping templates to manufacturers offshore, to arranging the safe arrival of the finished product, we can handle the full range of project tasks. 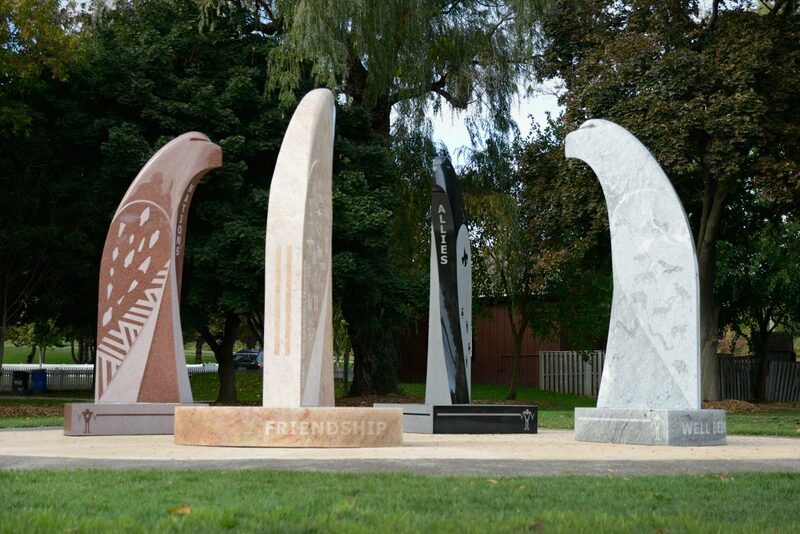 Granite eagles in four different colours were supplied to David General. Sandblast work and installation at Battlefield House in Stoney Creek, ON was done by HGH Granite.